Is Northbounders a true story? The events in the book are true but character names and settings are often changed for privacy. And of course, there are those out there that would say that it can't be true because dogs can't talk. I'll leave that for you to decide. What was Copper like as a puppy? We don't know. 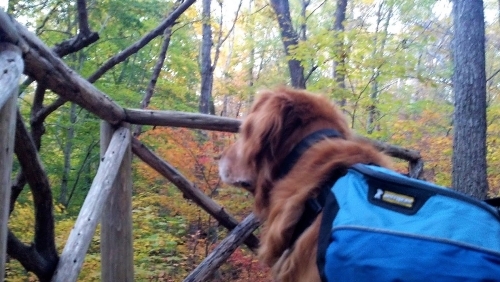 Copper was a rescue dog. The veterinarian estimated him to be about 7 years old when he found us. How did you rescue him? He kept coming to our house but standing far away. Then one day, he let us feed and pet him. We soon realized that he was highly trained. After an unsuccessful search to find his owners, he became ours. How did you know he was highly trained? It was obvious from our first encounters. He wouldn't enter a door until invited in, he would stay, sit and and lie down on command, and he wouldn't eat any food until given permission. We could have left a steak on the floor, gone to work for 8 hours, and the steak would have been right where we left it upon our return home. What was your favorite thing to do/play with Copper? My favorite thing was taking long walks in the woods and on the beach with him. Even though he was a Golden Retriever, he wasn't much for playing fetch. 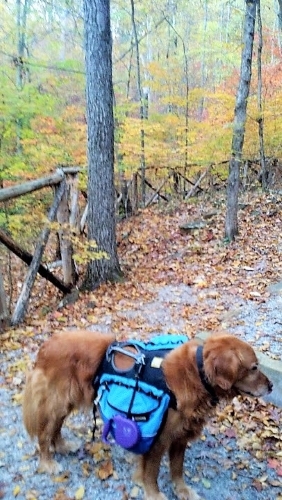 Somehow, he missed the "retrieving gene". He would bring a thrown ball or stick back once. If you threw it again, he would look at you as if to say, "Why should I go to the trouble of bringing it back to you if you're just going to throw it away?" Was there anything that Copper was afraid of? Oh. My. Goodness. Yes! He was deathly afraid of thunder, lightning, fireworks, and guns. He became "super dog" and could move anything in his way to get away from those noises. Is there anything that was really special about Copper? There were so many things. The one I cherish is how happy he was when the whole family was together. He would lay on the floor, cross his front paws, and just watch us. Blast here, with a blast from the past. 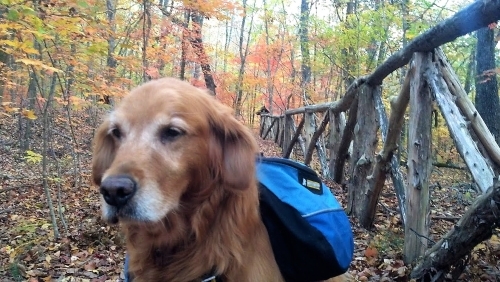 Back in fall 2011, I had just bought Copper the backpack he would end up carrying all his food in on the Appalachian Trail. He found it strange and awkward at first, but, with his thick fur, he never seemed uncomfortable nor had any trouble moving with it on. But just to make sure, we went for a walk in the park. Look at how shiny and new that pack looked back then!